Matterhorn Capital DC Management UK are delighted to announce the selection of the Paradigm Housing Group with V10 Homes as the enabling partner for the delivery of a 142 house and apartment development at Asheridge Road, Chesham. 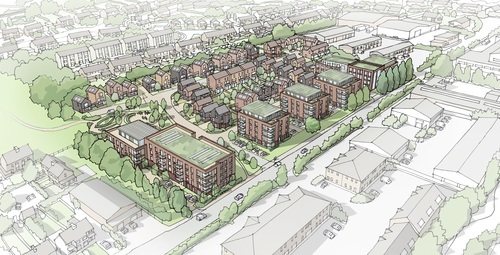 "Following extensive public consultation and a comprehensive planning process that secured detailed planning approval for 142 houses and apartments and 3,619 sqm of Enterprise Business Space in Chesham, we selected Paradigm Housing and V10 Homes as our enabling partner to bring this exciting project to conclusion. Paradigm is one of the largest Housing Associations in the Thames Valley with almost 15,000 properties. Paradigm is due to commence development of the Chesham site in the first half of 2018 with new homes available for occupation from mid-2019." "Paradigm is delighted to be working with Matterhorn to create this substantial residential scheme in the heart of our key operational area. V10 Homes introduced the project to Paradigm and will assist in the scheme delivery. Shaw Corporation co-ordinated the planning application and the planning team in achieving the detailed planning consent. They also negotiated the delivery terms with Paradigm and V10 Homes." "This is the first major residential scheme in Chesham for over a decade. The outer London market has seen significant activity and growth over the last two years. High London residential values have priced many first-time buyers, homeowners and downsizers out of the owner-occupier market. Transport regionally as well as locally are key factors in the growth and housing agenda. Considerable support for the scheme locally demonstrates the frustration at the lack of new build quality housing delivery in the area and the urgent need for more reasonably priced housing for local residents." This press release was distributed by ResponseSource Press Release Wire on behalf of Shaw Corporation in the following categories: Business & Finance, Public Sector, Third Sector & Legal, Construction & Property, for more information visit https://pressreleasewire.responsesource.com/about.